The digital sector is particularly dynamic and changing rapidly in technology and uses. It must go hand in hand with the evolution in local government administration’s missions. introduction of a process for continuous skills boosting of the municipal staff. 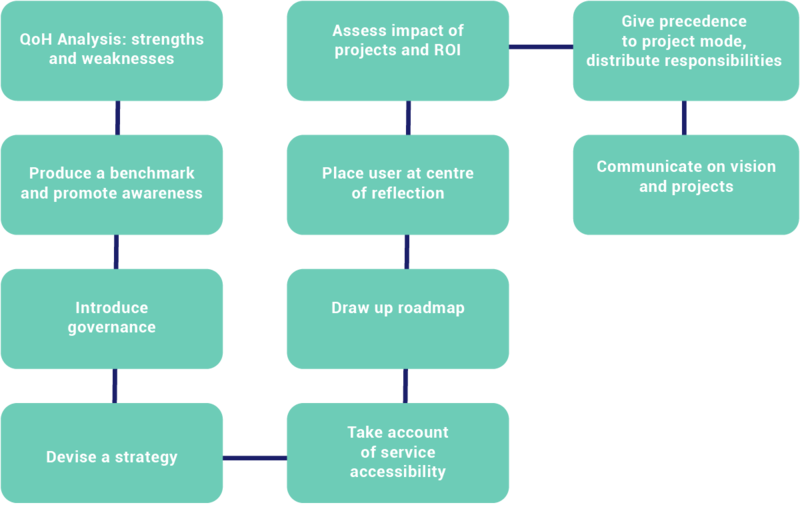 Once several pilot projects have been tested and evaluated, it becomes possible to derive lessons from them and prepare the design of a local digital plan. According to feedback from experiences, this approach is more a result of than a preparation for the introduction of digital technology on a territory. It aims to spread the pilot projects on the scale of the territory following the same methodological stages as for a sector project. It may be useful to have recourse to smart city project management support: service providers, specialists in the domain (consulting firms) can contribute to clearly defining the strategic project, establishing a more in-depth diagnosis of the digital maturity of territory and local authority, to master the technical and regulatory environment, discover reserves of opportunities and optimise local public action thanks to digital tools. drafting of proposals for data management modes. The local officers must be both capable and convinced of the potential of ICT to improve their working conditions and methods. The training of employees in the use of digital tools is a pre-requisite that can be facilitated today via online tools, such as MOOCs, awareness-raising games and forums for exchanging practices. Raising the awareness of the elected representatives themselves can make a useful contribution to this general mobilisation, making them able, on the one hand, to collectively define the digital strategy and, on the other, to make sure, each in their own domain of responsibility, that it is deployed appropriately by the local government teams. The use of digital technology for training, or e-learning, can apply to the ICT sector itself but more broadly to all domains of urban and local action. This may also be an indirect way of promoting awareness of digital technology: online training on drawing up the land registry map, crisis management or tourist strategies, can serve to highlight the potential of digital technology, to familiarise project leaders with digital tools. Local authorities will do well to take advantage of the availability of open, free tools and software, as well as forums and online training. The dematerialisation of exchanges facilitates learning methods for the new digital tools. All these tools and digital contents allow local authorities to identify what already exists, what can be done, and the methods used by other cities to implement their digital projects. Internally and externally, online training can accelerate the boosting of local digital skills remotely and inexpensively. Still rare are those local authorities who undertake such a process alone, and it is often with incentives or support from the State, donors or foundations that the initiatives emerge. The appeal of “open government” or “open data” can stimulate exchanges between peers and offer opportunities that incite local authorities to engage in such a process. Lastly, digital technology is also a tool that allows exchanges of experience and the sharing of best practices. The constitution of networks of cities for the appropriation of digital technology, their challenges and conditions, can benefit from ICT to boost these exchanges. The novelty of digital technology makes the sector particularly dynamic and at the same time unstable: experience feedback is therefore still relatively fresh. Peer exchanges are the most reliable source and the most responsive means at the present time for learning what is being done, what works or doesn’t work and what can be done simply in a very concrete manner. Intermediate cities network to create jobs thanks to digital technology. The European URBACT programme allows eleven cities in proximity to major “hubs” to learn on the general theme of job creation. The work takes place on two scales. local activities in each city from a local URBACT support group combining all the stakeholders around the local authority. Each group has the aim of drawing up a local digital agenda on the selected theme. identification of actions to be co-managed by stakeholders (June 2017 to May 2018). Peer dialogue (city to city) is a powerful vehicle for learning. The cities forming a network must make sure they all want to learn from each other and must find donors to fund their local and transnational activities. Taking advantage of the experience of a city in the North to introduce digital services and spaces for citizen dialogue in a municipality in the South. Guediawaye is one of four municipalities that compose the agglomeration of Dakar. The different municipal teams launched participatory planning experiments, in particular around projects to encourage the use of digital technology (municipal websites, e-learning, micro-credits, etc.). To provide consistency in the overall development of digital technology in the city, a decentralized cooperation project emerged in 2008 involving the municipality, the agglomeration community of Castres-Mazamet and the University of Toulouse (France). The French municipality placed its experience and know-how at the service of Guediawaye for the development of a digital platform recognised as one of the major vectors of local development (economic, teaching and research). Between 2007 and 2010, a first phase enabled the introduction of a pilot GIS GIS Geographic information system: system designed to gather, store, process, analyse, manage and display all types of spatial and geographic data for more efficient management of municipal services and the circulation of mapping for the use of decision-makers and civil society. A collaborative portal was also developed to exchange and pool initiatives of the different categories of stakeholders, make available up-to-date information matching citizens’ needs, and teach them to use the tools (use perceived as unavoidable). Two other phases were implemented over the 2010-2015 period: one for institutional capacity-building and appropriation of the tools by local stakeholders, the other, funded by AFD, for examining the possibilities of regional spin-offs. The decentralized cooperation mechanisms enabled the development of peer-to-peer learning and capacity-building of stakeholders by adapting a French solution to the needs of a Senegalese city..